Brian Schwartz sent in a personal review/letter via Twitter this morning. He's given me his permission to reprint his piece here, so please see it below. Quite a lovely and articulate piece! Big thanks to Brian both for writing and for allowing me to show off his work! The Lord of the Rings trilogy was unlike any movie I had seen before. I had not read the books prior to viewing, but finally did so before the release of The Return of the King. In the three hours it took to watch The Fellowship of the Ring for the first time, a world I had previously known nothing about became all I thought about for years to come with repeat viewings of each trilogy, and then even more when the extended editions were released. Everything about the Lord of the Rings universe in front of and behind the camera amazed me – the story, the characters, the locations, the themes, and all the hard work that went into bringing what were thought to be un-filmable books to life. As someone who has always been a fan of film music, going back to my childhood with all the wonderful scores John Williams created, I thoroughly enjoyed the scores to all three Lord of the Rings films. I listened to the two CD releases each film got (theatrical and complete recordings) again and again, and took in the scores’ themes for all the music highlighting the different characters, places, and themes. Whether in quieter moments of deep thought or the thrill of epic battlefields, I was captivated. The more I listened to the scores, the more I heard something new in them each time. Just when I thought I had almost gotten these scores figured out, your book showed me that I had barely scratched the surface. You have accomplished what is arguably the most attentive and thorough analysis of a film score I have ever read. I only wish all my favorite film scores could receive the same treatment you brought to this project. I was astounded by the subtle observations regarding the placement and variations of leitmotifs and the feelings they reflect with the rest of the films. You have turned the scores into their own entity – one could listen only to the scores and know exactly what is happening in the story, as well as what feelings are associated with each part. I played the music in my head as I read through each track description, often waiting for the music to catch up before I could move on! While I do not know how to read music, nor was I familiar with some of the terminology in the book, the context you provided made everything perfectly clear to me. I am hearing these scores in a completely new light now, and I can’t wait to watch the films again soon (after practically wearing out the DVD player a few years back with so many viewings). Once I finished the book, I felt like I had been on a great and personal journey – the same way I felt after finishing the books and films. Thank you so much for all the wonderful work you’ve done on this. Bring on The Hobbit! If you received The Music of the Lord of the Rings Films for the holidays, please consider sending in an image for the Show Us Your Book album seen to the right. You can send your image either to me or to Magpie, our generous steward. I've received emails and short notes from around the world over the past months, and would love to show just how far our little project has come! In a year that's been almost entirely about rings for me, I'm happy to announce that we've just introduced one more into the mix. My wonderful Jill, who many of you have met on this year's adventures, has just agreed to be my wife. The Two Towers: Live to Projection is coming to Lyon, France for a five-date stay this coming June. The Orchestre national de Lyon, under the baton of Maestro Ludwig Wicki, will perform Howard Shore's music on June 23, 24, 25, 27 and 28, 2011. Click here for additional info, should the inclination lead you. 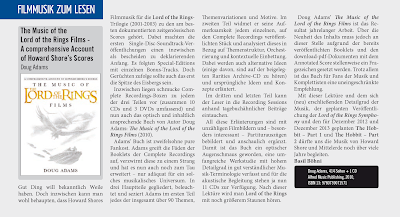 Basil Böhni has kindly sent us over an early version of CinemaMusica's review of The Music of the Lord of the Rings Films. It's in German, but I've included a rough translation below. Be sure to click on the image to see the original article. Thanks, Basil! Good things are knows to come to those who wait. One can safely to say that Howard Shore's scores for The Lord of the Rings trilogy are among the best-documented contemporary music. The single-disc soundtrack releases are now seen as modest beginnings. These were followed by Special Editions with several bonus tracks. But even these were just the tips of the iceberg. Next were the Complete Recordings boxes, which together were comprised of 10 CDs and 3 DVDs. And now an appealing new book by author Doug Adams has appeared: The Music of the Lord of the Rings Films. Adams' book is a pure treat for fans. The author takes up the threads of the booklets of the Complete Recordings and weaves these strands together and expands them – as is adequate for such a musical universe. The book has three main parts. In the first, Adams illuminates and dissects each of the more than 90 themes, variations and motifs. In second part, he devotes his attention to the individual compositions in the Complete Recordings by analyzing structure, orchestration, and contextual meaning. He also discusses early and alternate musical ideas (some of which are on the enclosed Rarities Archive CD). The third and final part, The Recording Sessions, consists of diary-like posts. All this detail is complemented by countless pictures, film stills, and – especially interesting – printed score excerpts. The book is, therefore, both a visual treat and an extensive detailed work, written in plain language and terminology, which enhances the 11 CDs of the Complete Recordings. After this reading this book, one will listed to The Lord of the Rings with even greater amazement. Doug Adams' The Music of the Lord of the Rings Films is the result of years of work. The novelty of the content may be drawn into question be at this point, due to the previously published booklets and Annotated Scores. Despite this, the book receives an unrestricted recommendation to all completists and fans of this music. 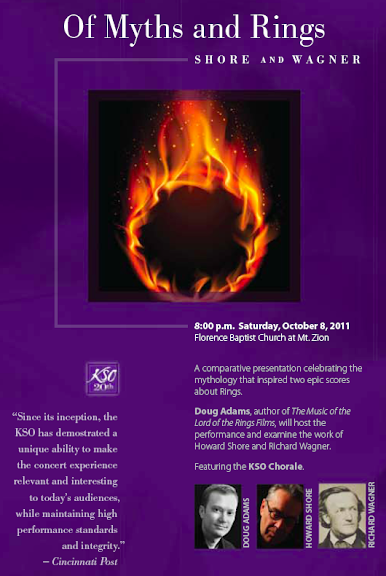 The book’s new details, the planned recording of The Lord of the Rings Symphony, and the upcoming December 2012 and 2013 releases of The Hobbit films means Howard Shore’s music for Middle-earth will accompany us for many years. A huge thanks to everyone who braved the frigid Chicago weather last week in order to attend the Music of the LOTR Films events on Wednesday and Friday! That said, I'm not sure that we had a whole lot of bloggees in attendance ... and for that I was quite thankful. That sounds bad ... hear me out! While it's always slightly scary to hold events such as this without your friendly faces in the room, it's also quite exciting. A room full of new faces means a room full of the uninitiated. Time and again this past week I heard "Oh, this is a perfect gift for Relative X! I didn't know this existed. Great!" and "I can't believe someone has finally done a film music book like this! I've been looking for something like this for years!" I love to think that each time we head out into the public we're reaching a fresh group -- readers/listeners for whom we're illuminating Howard Shore's work anew. Now this said, there's 'uninitiated,' and there's 'UNINITIATED." 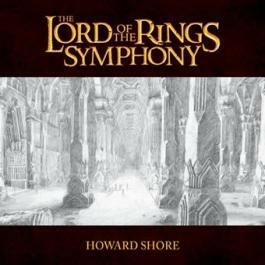 Friday's event at the vast McCormick Place was full of the former ... musicians young and old who may not have known that the book existed, but who knew what Howard Shore had accomplished with his music, and who understood how this book was relating to it. Wednesday, on the other hand ... ah, Wednesday ... While I can't speak for the majority of Wednesday's crowd at Borders, I can, without the faintest shadow of a doubt, assure you that one or two attendees fell into the latter, all-caps 'UNINITIATED' camp. I say that with a bit of a chuckle, but I was sweating up there! Ah, showbiz ... will the glamor never end? I'll be honest, I walked away from the event muttering to myself, "What just happened!? ", but now I find the whole thing pretty darn funny. And since the week ended on such a overwhelmingly positive note, I'm really just glad to have accumulated such an excellent anecdote. I think the crowd back in New York certainly got a kick out of it. At least one email appeared with the subject "Are You Tony Blair?" Back soon with at least one more pre-Christmas post. See you on the boards in the meantime! "Doug Adams outlines a magical, almost supernatural musical journey that, for many Tolkien fans, paved the way to Middle-earth and the [LOTR] films in a enriching and unforgettable way. I recommend this book warmly for the sophisticated design and the CD's unreleased material, and with the hope that many more Tolkien fans will appreciate this musical analysis of impressive trilogy." Read the full review right here ... and feel free to clean up my sketchy translations above. In the meantime, hope to see many of you in Chicago tomorrow night! I'm incredibly excited to finally have an event close to home, so help spread the word! I'm late posting this month, but since no one's December is anything less than a mad-dash these days, I won't attempt to complain about my schedule. So instead of bellyaching, I'll offer up a little gift. Please enjoy the following bonbon -- a quickie arrangement assembled by me and me alone (not Mr. Shore, to whom I apologize in advance): Gondorian Merry Gentlemen. Back soon with more Chicago news. I'm posting this again, because the original press release listed the wrong address for the Borders in Lincoln Park. And anyway, it never hurts to post these things twice! (November 22, 2010—New York, NY) The Music of Lord of the Rings Films book has been receiving rave reviews since its early fall release by Carpentier and Alfred Music Publishing. The perfect holiday gift for any fan of The Lord of the Rings, the book is a 416-page full-color volume featuring a Foreword by Howard Shore, an Introduction by The Lord of the Rings screenwriter/producer Fran Walsh, original sketches by John Howe and Alan Lee, and numerous images from the films. Also included in the book, courtesy of Howe Records, is “The Lord of the Rings: The Rarities Archive” a CD presenting 21 tracks of previously unreleased music created for the films, and an audio interview with Howard Shore. Its author, Doug Adams, will be making several appearances in the Chicago area in support of its release. Doug Adams, a Chicago-based author and musicologist, was invited in 2001 by Howard Shore to observe and document his work on Peter Jackson’s motion picture trilogy. Adams attended recording sessions, examined the original scores, and was given complete access to the composer’s archives. As an acknowledged authority on Howard Shore’s music, Adams has become a regular fixture at concerts and events across the globe. He runs the popular blog, www.musicoflotr.com, which documents his work on this project and brings fans together in ongoing discussions. Alfred Music Publishing is one of the world’s largest music publishers. Alfred is based in Los Angeles with domestic offices in Miami & New York as well as around the world including Australia, Germany, Singapore & the United Kingdom.